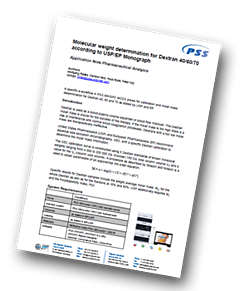 PSS has produced an application note demonstrating a specific workflow in which its PSS WinGPC Software allows for calibration and molar mass determination for Dextran 40, 60 and 70 as stated by United States Pharmacopeia (USP) and European Pharmacopoeia (EP). Dextran is used as a blood plasma volume expander or blood flow improver. The Dextran molar mass is crucial for the success of the therapy. If the molar mass is too high there is a risk of interference with normal blood coagulation processes. Dextrans with a too low molar mass are therapeutically ineffective. USP and EP recommend aqueous size exclusion chromatography, SEC, with a specific Dextran calibration to determine the molar mass information. This is a standard technique in different pharmacopoeias (USP , Pharm. Eur., British, Chinese and Japanese monographs) to determine molecular weights and molecular weight distributions (MWDs) in pharmaceutical testing of Dextrans. Such experiments can be performed by PSS SECcurity and SECcurity² GPC/SEC systems. The SEC calibration curve is constructed using 5 Dextran standards of known molecular weights ranging from 4,000 to 250,000 Da, Glucose (180 Da, total column volume V1) and a value for the V0 (column void volume). A procedure as described by Nilsson a Nilsson is used to obtain parameters of an exponential 3rd order equation. Specific results for Dextran samples include the weight average molar mass, Mw, for the whole Dextran as well as for the fractions at 10% and 90%. USP additionally requires Mn and the Polydispersity Index, PDI. 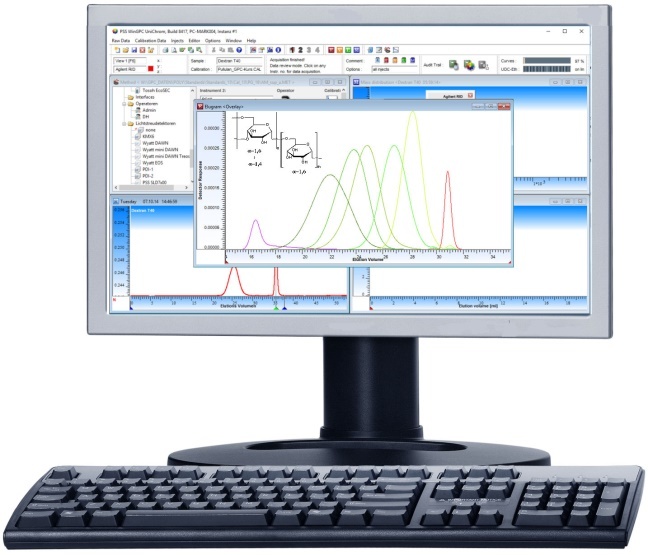 PSS WinGPC Software has a specific e-workflow implemented comprising data capture, specific dextran calibration, data analysis and compliant reporting. Regulated laboratories should opt for the WinGPC UniChrom Compliance Pack for FDA 21CFR11 support including audit trails and electronic signatures.